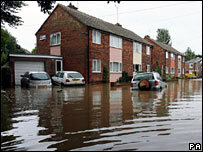 A review into the causes and response to the floods which devastated parts of England has been ordered by ministers. The inquiry will look at why flooding was so extensive, the response and if they could have been predicted. Four people died in the floods which inundated parts of the Midlands and Yorkshire, with more than 30,000 homes and 7,000 businesses affected. Environment Secretary Hilary Benn said lessons must be learnt on responding to and managing this "type of disaster". Thousands of people are still being housed in temporary accommodation. The inquiry will seek views from residents, councillors and members of the emergency services, and will report by the end of the year. In a Commons statement Mr Benn said the response of emergency services, local authorities and communities had been "impressive". "However, as the affected communities, businesses and individuals move to the long and difficult task of recovery, they are understandably asking questions about the flooding - its causes and subsequent management," he said. The Conservatives had called for an independent inquiry, but the review will be led by officials from the Cabinet Office. The review will look at why the flooding was so extensive, whether its scale and impact could have been predicted, whether the response was well coordinated enough and whether those involved had the right support and equipment. It will also cover information given to the public and the transition from response to recovery. Earlier the Environment Agency told the Yorkshire Regional Flood Defence Committee that the flooding had been a "once in 400-year event" and said river defences had been effective. Meanwhile the chairmen of all flood defence committees in England have written to Mr Benn to voice "deep concern" about the maintenance of defences in the future. Downing Street has rejected suggestions the government had been slow to react to the floods crisis.